Located in a charming residential and neighbourhood in San Francisco, the Victorian-styled Queen Anne Hotel in Pacific Heights is charming and quaint. These are just some of the reasons why guests do not want to leave, even when they are already dead. Spending the night alone in one of the rooms in the Queen Anne Hotel would definitely make one nervous after hearing the many ghost stories told about it. The building used to be a finishing school for girls and it is said that the school’s headmistress, Miss Mary Lake, still remains in the hotel and manifests herself in Room 410, the Mary Lake suite. She would gently tuck in sleeping travellers by making sure that they are covered by blankets. Cold spots are often reported by guests sleeping in the room. She is also reported to unpack travellers’ bags. However, she does not confine herself in her room. She has also been seen wandering the hotel’s hallways, looking at herself in the mirror and sometimes playing piano in the lobby. Offering the best Victorian architecture with 48 rooms for guests, the Queen Anne Hotel gives its guests impeccable service and tasteful decors. Each of the rooms is individually furnished with authentic Victorian antiques and come with breezy floor-to-ceiling windows. The suites also come with top of the line amenities. There are four types of suites to choose from, the Junior Suite; One-Bedroom Suite; Two Bedroom Suites and the Honeymoon Garden Suite. There are also four types of rooms; Victorian, Deluxe and Superior. Victorian rooms are the most economical but still offer several comforts for travellers. Deluxe rooms come with a single king bed or two queen beds. Some Deluxe rooms also come with a breakfast nook or a fireplace. Superior rooms are more spacious and also come with a fireplace and a breakfast nook. The hotel’s quiet backdrop makes the perfect reception for meetings, weddings and other events. The hotel’s wedding venue can easily accommodate 150 people and 80 people for buffet-style receptions. For meeting rooms, there is The Salon, The Boardroom, The Courtyard and The Library to choose from. The city of San Francisco offers an endless list of attractions. Golden Gate Park is home to two of the world’s most amazing museums, the De Young Museum and the California Academy of Sciences. Bring the entire family along and be awed by the things waiting for you to discover. 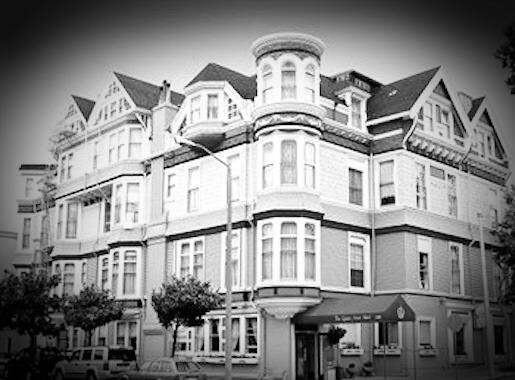 Queen Anne Hotel is perfect for food connoisseurs because it is very near some of the finest restaurants in San Francisco. Sweet Maple is a wonderful new addition in the neighbourhood which serves breakfast, brunch and lunch. Other delightful places to go to are Curbside Café, Benihana, Maharani Restaurant, Sophie’s Crepes, Wine Jar and Via Veneto. Other local attractions are Alcatraz, China Town, Japan Town, Union Square, Filmore Street and Cable Cars.